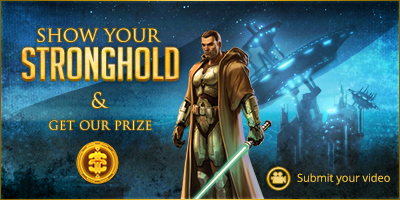 To celebrate the release of the Galactic Strongholds expansion, I am holding a giveaway. Let's get to the important part first, the prizes. 5,500 Cartel Coins. The grand prize, a 5,500 Cartel Coin code from Amazon! You can have a chance of winning this by submitting a video of your stronghold. Tauntaun Fawn Pet. I have 10 Tauntaun Fawn pet codes to giveaway courtesy of BioWare. You can enter the drawing for these by just helping spread the word. When: The drawings will happen on September 21st at 9am EST. So Werit, how do I win one of these? Good question! I've included a How-To video below. On the right side of the page is the Sites with Benefits widget. Click on it and login. Now you can do missions which award points. You can spend those points on lottery tickets. Do as many as you would like, that's all there is to it. Submit a Video. Have a stronghold you want to show off? Make a video and submit it through the widget. The video must contain 'Sites with Benefits' somewhere in the description. This lets me know it is yours.